Tikal is a popular tour for those visiting San Ignacio. It is one of the most largest Mayan ruin sites, however also one of the most recently excavated. Since it is recently excavated, not all the structures have been excavated. Many still remain unearthed under a mound of dirt, shrubs, and even trees. In my opinion, this gives me a great picture of ancient Tikal and what the place looked like unexcavated. That is I understood both the power of the ancient Mayans, and how nature can quickly reclaim a once great nation. The clear downfall to being recently excavated is that many ruins are left unexcavated, and even fewer are open to be climbed. The good news is that the ones that can be climbed offer amazing vantage points, some above all tree line offering an amazing photo. And to be honest, I climbing up (and the scarier portion down) 3 of the ruins was more than enough exercise and after seeing 4-5 ruins, many started to look similar. 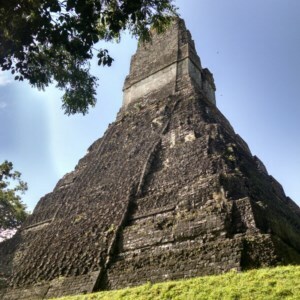 One thing to note is that since Tikal is physically located in Guatemala (neighboring Belize), extra travel time is required to pass through customs (plus additional fees) in addition to the two hour drive. Add in the lunch and you’re looking at a 9-10 hour day. Travelling to Tikal is mostly a paved road (similar road conditions that are found in Belize) plus a small unpaved section. Our tour guide Willy, with Belize Nature Travel, did an amazing job at explaining the history behind the ruins. The 9 statues plus 9 door openings, how the buildings were built with astronomical significance, and a suggestion to how life was in Tikal. We made a point to rush us to the Tikal as early as possible, making as few stops as possible so we could get there before the crowds arrived. Crowds include many locals, but not cruise ship guests. Tikal is too far for cruise ship guests.